An historically important model, reference 1436 is a horological marvel. 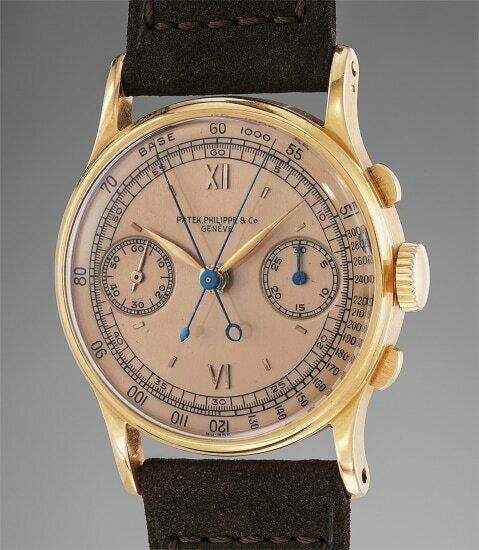 The first split seconds chronograph wristwatch that Patek Philippe ever produced in a series, the model was originally launched in 1938. Most impressively, the rattrapante chronograph mechanism is housed within the confines of a 33 millimeter case. Predominantly produced in yellow gold, the model was very rarely cased in pink gold. Research suggests that less than 9 examples have survived in pink gold, with exceedingly few examples featuring a pink dial, such as the present watch. This watch combines the rarest and most desirable features of the reference and is nothing short of stunning. The pink gold case is preserved in impressive condition with sharp facets and finishes throughout. A hallmark is clearly punched to the left band, along with another on the upper right lug. The unsigned crown is correct and original. Early examples featured a crown that would act as a button to split and reunite the two seconds chronograph hands. It was only later that the crown was fitted with a co-axial push button to reunite the split seconds function. The beauty of the watch lies in its extraordinary pink dial. The long signature is correct and all commas and accents are visible and present. Most importantly, the dial is confirmed by the Extract from the Archives, which states the watch was sold with rose dial and tachymeter scale in 1940. It is a rare and extremely notable occasion when the Extract confirms this important detail, further enhancing the collectibility and value of this spectacular timepiece. Originally consigned at auction by the family of the original owner in 2007, this watch reappeared on the market in 2013. This three-owner-since-new timepiece has a clear trail of provenance that adds another layer of collectability.